We always want to get the most of every dollar that we spend for home equipment. As much as possible, we want a single package to include all accessories that we need for the tool. 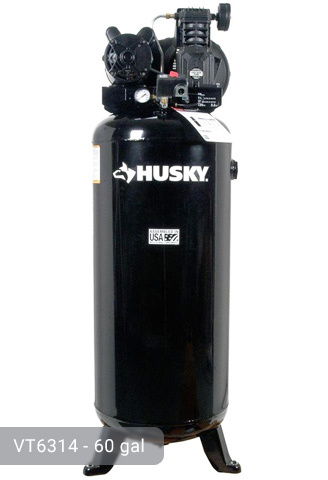 Well, here’s a great news: Husky 3 Gallon Air Compressor comes with a 9-Piece accessory kit and a 25-ft coil hose. The accessory kit includes the following: blow gun, blow gun adapter, OSHA safety nozzle, ¼ inch female quick connect, ¼ inch male and female plug, inflation needle, 6-inch dual tire chuck, and sealing tape. What more can you ask for? These materials are awesome additions to your collection of home equipment and accessories. 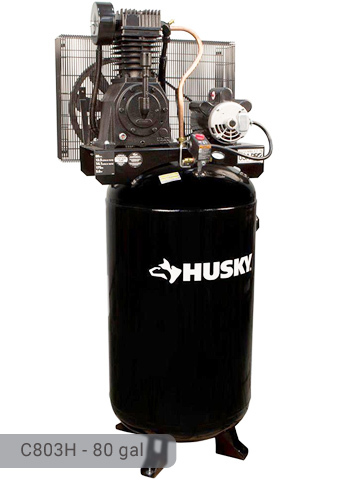 Husky 3 gal air compressor has an induction motor that runs at a powerful rate of 1 HP. It is oil-lubricated so you can expect the parts to run smoothly. You don’t have to worry about oil leaks because this one has an oil sight glass that provides easy viewing of oil level. The oil needs to be changed as necessary so for those who don’t have the luxury of time to check the compressor once in a while, the oil sight glass is convenient. As a good rule of thumb, the oil should be changed every 100 hours of operation or once every 12 months. 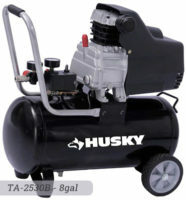 A direct-drive pump assists in the high-quality performance of the compressor. Its cast iron cylinder sleeve ensures durability. To avoid overheating, the pump has an aluminum head. It does not have belts or pulleys which can be easily damaged. This will help you save money for replacement parts. Air delivery is only at 2.4 SFCM at 90 psi. It is less powerful than the 8-gallon model but can definitely perform almost all the same functions such as nailing and blow cleaning. It cannot be used for heavy-duty industrial purposes. Tools that can be powered by this machine include but are not limited to crown stapler, brad nailer, cut-off tool, air ratchet, and some finish nailers. The air compressor has a very effective pressure gauge. When the air in the tank runs low, the compressor senses it and automatically turns the switch on. When the tank is full, it turns off in an instant. This is a critical matter because the entire tool depends on the ability of the pressure gauge to correctly detect the level of pressure. It is very easy to use and manipulate because you can operate it single-handedly. It is very portable weighing only 43 lbs. The handle gives you a good grip of the machine. The tank is hotdog-styled and has a twin stack configuration. It is made of steel that was designed to protect its contents. 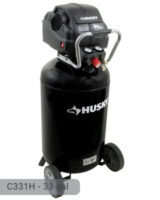 Considering its small size, the air compressor is perfect for light-duty tasks. 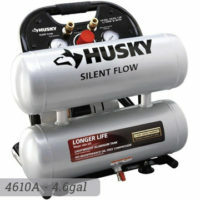 Husky 3 Gallon Air Compressor definitely has a good quality for its cheap price. The accessory kit that comes with the package saves not just your money but also your precious time should the need to buy them occur. Surely, you won’t get a deal that is better than this. 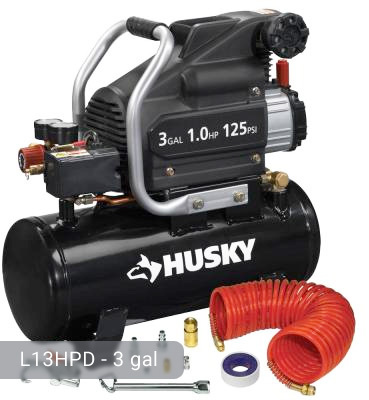 If you already own Husky L13HPD model or just want to buy it you can share your review or ask a question through the form below. How Much Are Inappropriate Uses of Compressed Air Costing Your Business? How To Determine Compressed Air Demand? How To Match Compressed Air Supply with Demand? Should You Buy A Used Air Compressor? What Should You Look For In A Dental Air Compressor? What Is A Compressed Air System? Husky Impact Wrench, H4430 – 300 ft. lbs. Husky Impact Wrench, H4455 – 650 ft. lbs. Husky Impact Wrench, H4480 – 800 ft. lbs. Husky 3/4 in. Impact Wrench , H4490 – 1400 ft.-lb.